Home Blog Helloooo from the Sea of Galilee!! There’s already so much to tell about, and I’m only two-thirds of the way through my first full day in the Holy Land! I left Monday (May 19) on an evening flight out of Chicago, connected to another flight in Rome, and landed in Tel Aviv around 7pm local time. On the same flight was our Israel Ministry of Tourism agent, Jill (who, I believe must be related to the Good Fairy). Once landed, we met our guide, Ron, who is courteous, funny, and well educated. My first surprise was learning that tour guides in Israel are required to get a degree akin to our Bachelor’s degree in the United States and that they must participate in continuing education and be recertified every two years. Additionally, the guides stay with their group the entire time, 24/7, overseeing and assuring that their guests are taken care of. Let me tell you, Ron’s education is paying off, because we’re learning a lot! Ron, Jill, and I had supper at a wonderful little restaurant called Zuni in Jerusalem. I had quiche (yum!) and a salad of root vegetables with a vinegar and oil dressing that was out of this world. Oh, I wanna make that at home!! Another surprise to me is the high number of people who speak English and speak it well. I need only say, “English, please?” and we’re set to go. Today we met the rest of our group at the airport. There are six of us from various corners of the Catholic media. After, we drove through the wadi – a dried-up river bed – which now has a highway through it. Very cool. We passed Mount Tabor on the way, and it was fun to imagine Peter and John sitting on the mountain top and gazing at our Transfigured Lord. Our first stop was Nazareth, and I got chills up and down my spine thinking about the Holy Family there, living loving, and working together. I thought of the community to which my husband and I belong, and the group of us who have adopted the Nazareth ideal for our own. Praying for all of us there was quite powerful. When we entered the Church of the Annunciation, I felt like I could hardly breathe. The air was fine; it was my heart’s reaction to the place. The grotto where the Annunciation took place is in the center, and visitors go down steps to stand before it. It’s gated, but you can stand at the gate and look inside to see the place where Mary gave her yes to becoming the Mother of God. My only thought the entire time was, “Mother Mary, you’ve visited my home, now I’m visiting yours.” I really could feel her there, welcoming me. When we entered the upper church, the Franciscan brothers were reciting the Angelus. What an amazing thing to pray the Angelus in the very spot in which it took place! Next we saw the Church of St. Joseph, and there I prayed for all the dads among my friends and family, especially the ones lacking sufficient or fulfilling employment. 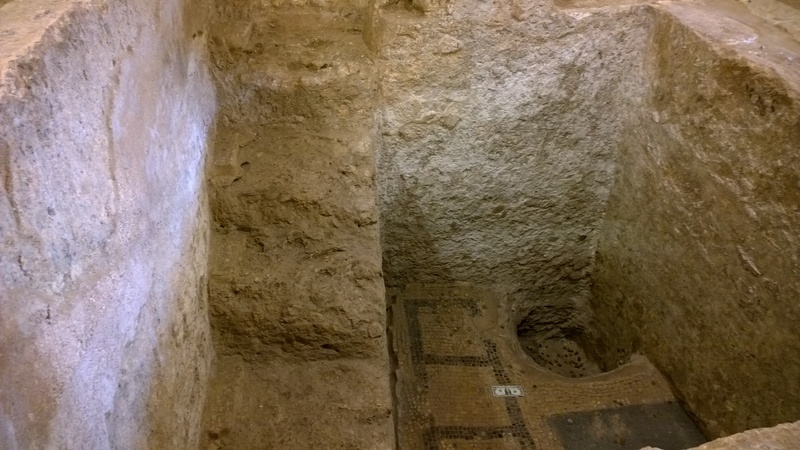 This church also is an excavation site, back-to-back with the Annunciation grotto, in which you can see what Nazareth really looked like during the Holy Family’s time. Very simple, very small, and very dark. But very holy. 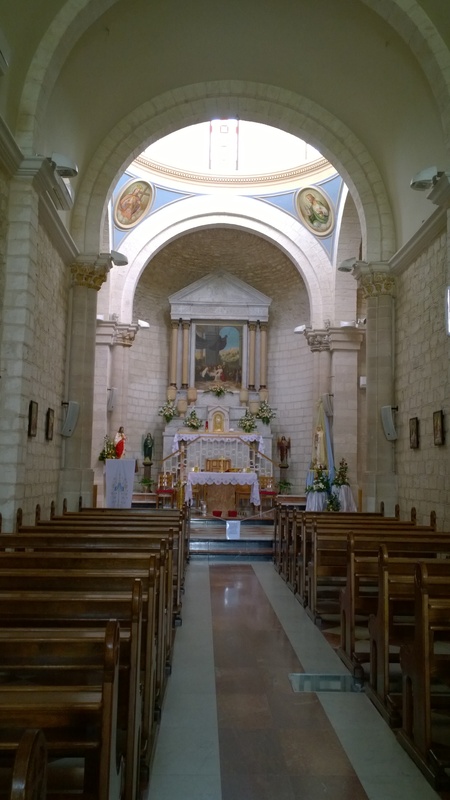 After Nazareth was Cana, with the Church of Cana where our Blessed Mother asked her Son to perform his first miracle. As is true for most of the Holy Land, there are now churches built on top of the holy places. That’s true in Cana, too. As I knelt there praying for the married and about-to-be married couples that are close to me, I could almost hear the music and laughter, and the shuffling of feet as Mary, Jesus, the disciples, bride, groom, and guests enjoyed the wedding banquet. I “saw” Mary approaching Jesus and the miracle taking place. Leaving the Church of Cana was hard for me. I didn’t want the banquet to end. I have a feeling that most of my trip will be that way. For now, I’m taking a short rest in my hotel room on the shore of the Sea of Galilee. Then, it’s on to dinner with the group, back to the hotel to rest, and then…another day of adventure! Can you coax a dog out of a suitcase? I’ve got to catch a flight to Israel! Brought tears to my eyes. It’s such a blessing that I have read your book Imitating Mary talking about these topics. Now your are physically there. Bringing us closer to that heart of Mary. Bless you and thank you! Please pray for me in my vocation as a mother and wife. That my home be as simple and peaceful, a bit like the Holy Family’s. 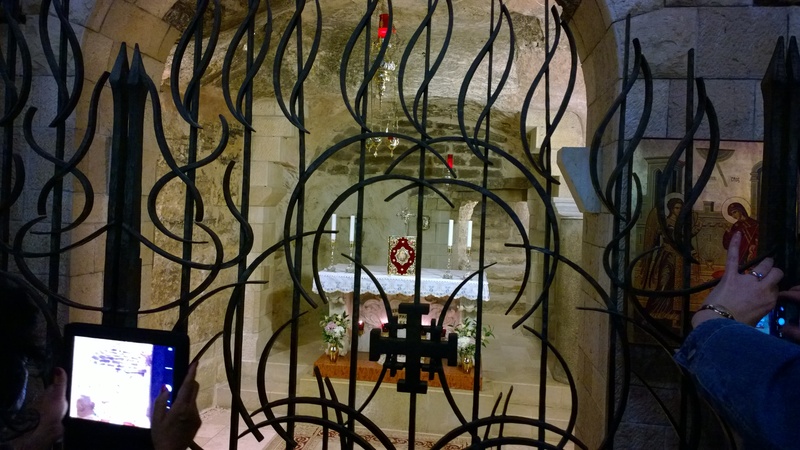 Thank you Margaret for taking your Nazareth Family to these precious sites! Thank you, Marge, for giving us the opportunity and excitement to experience the Holy Land through you. It is awesome! tears are flowing, Marge, gosh how you are soooo blessed with your way with words, makes me feel as though I’m rt. there with you, soo much beauty, thanx for thinking and praying for us esp in Cana for our marriage! Greetings from our Father and Founders Exile City! This morning I could come to my office, open my gmail and enjoy every post you made. With prayers and daily sacrifices I accompanied you. May you take into your heart and memory your experiences and feelings as you walk the land in which Jesus touched and sanctified the earth. Like I so are many looking forward when you return and give on to your “co-pilgrims in thought and prayers” your experiences.